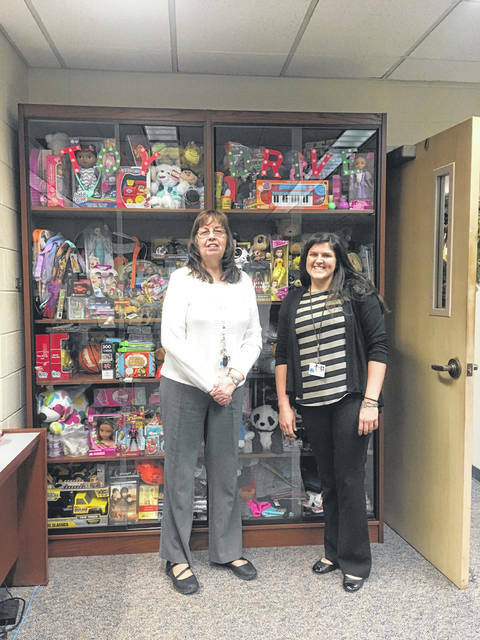 The display case in the Portsmouth Public Library is bursting at the seams with toys and items for their ‘Donate-a-Toy’ drive. The library is celebrating its 18th year for the annual toy drive. Carolyn Cottrell, local history supervisor at the library, started the drive in 2000 and it has grown every year since then. Katie Williams, publicity/program manager, says a lot of their patrons, are used to them having the drive and start asking when they will start the drives. Both she and Cottrell say they put the word out on Facebook and their flyers. “We have beat our goal every year,” says Cottrell. She said all the toys collected will be given to Scioto County Children’s Services, and this is the third year they have worked with the organization specifically. Children’s Services has a gathering, they have a list of the families of where the children are, and they then give the the gifts to the children. “It’s always exciting when Children’s Services come to pick the toys up, they can’t believe all the toys that the library has collected,” says Williams. “Last year, they barely had room for all of them, and this year, they might have to bring two vehicles,” added Cottrell. Williams said the donated toys do have to be new and not wrapped, but sometimes during this time of year, parents will be cleaning out closets and find new toys that have never been opened and they will donate them. Williams says that people can donate toys to any of the local branches and they will get them added to the collection. They have toys and games for all ages that have been donated. There were headphones, rubics cubes, stuffed toys, trucks, dolls, action hero figures, books, sports items and so many other toys that have nearly filled the case to its capacity, but they are still taking donations up and through Dec. 10th. Williams says they will have patrons that come in and ask what age group they need toys for the most. “What is really fun,” Cottrell says,“is we have patrons who are bringing their children in and the children hand over the toys.” Each year they say they think they won’t reach their goal, but this year they had reached their goal three weeks before time. They humorously said that Cottrell reminds the staff there at the library when it is payday so they could donate, and if she sees things on sale she’ll send out emails, but the employees there enjoy being part of the project. The toys can be for a boy or a girl for ages infant to 16 years of age. They do ask that if a toy needs batteries, that it be provided with the toy, and the toy needs to be unwrapped. The ‘Donate -a-Toy’ drive will continue until December 10, and they invite the community to bring in donations. The library had set a goal of collecting over 400 items and they have already reached that goal, so their goal now before the end of the drive is to reach 500 items. For information about the drive or to donate, call the Local History Department at 740-354-5304.